Feed Preview is a Firefox add-on that indicates available RSS and Atom feeds to the user and may also render previews of feeds directly in the browser. Mozilla removed RSS preview options in Firefox 64 because it had an "outsized maintenance and security impact relative to" usage numbers. The removal impacted RSS feeds and live bookmarks alike; Firefox users could install extensions like Livemarks to restore functionality in the browser. Feed Preview is a browser extension for current versions of Firefox that integrates feed indicators and previews in the browser again. Current versions of Firefox don't indicate RSS news feeds to users of the browser anymore. That is a problem for Firefox users who use RSS; while it is still possible to detect RSS feeds manually, either when a site lists RSS as an option or by looking in the code, it is not as comfortable as a function that does so automatically. Feed Preview adds the classic RSS icon to the Firefox address bar again when it detects RSS or Atom feeds on the active page. A click on the icon displays all available feeds. Each feed is listed with its type, e.g. RSS, and name. 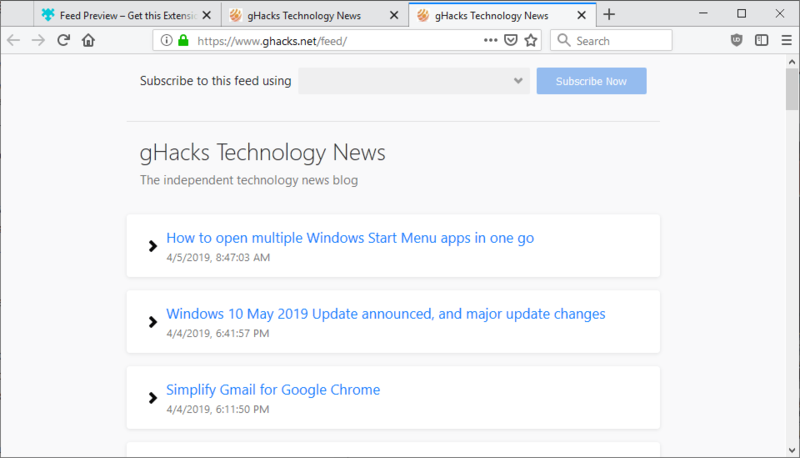 The extension lists the two available main feeds here on Ghacks when you click on the icon when the homepage is active. You get different feed options depending on the active page; categories and tags have their own feeds that you may subscribe to. A click on one of the supported feeds opens it as a preview in a new tab in the Firefox browser. The preview looks clean and elegant, and you may use it to verify that it works properly. An option to subscribe to the feed is provided at the top but it works only if a RSS feed reader is registered. Feed Preview supports several online feed readers such as Feedly, FlowReader, InoReader, or The Old Reader by default. You may add other (online) RSS services to the application to add support for them in the extension; this is done in the extension preferences. You may still copy the feed URL manually to include it in your RSS feed reader of choice, e.g. when you are using a desktop feed reader like QuiteRSS and not an online feed reader. 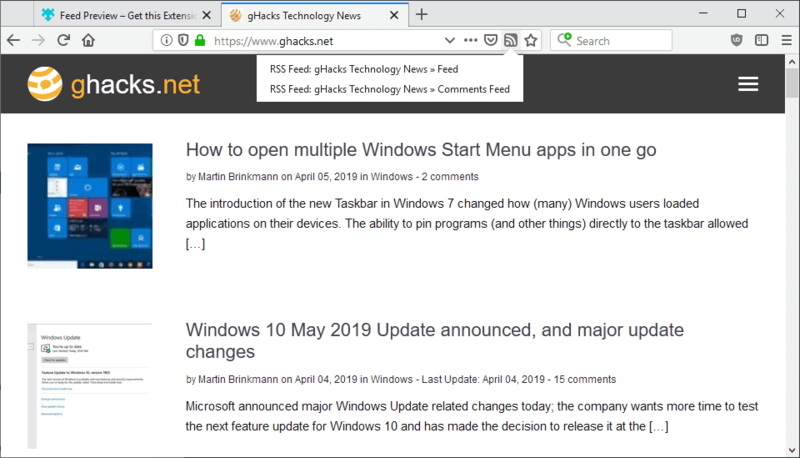 Feed Preview adds two main (and missing) features to Firefox: the discovery of RSS feeds on websites you visit and options to preview these feeds directly in the browser. Whether that is enough to give it a try depends on whether you use RSS feeds. I like the discoverability part of the extension as it highlights available RSS feeds on load directly. Makes it easier to copy the feed URL especially if a site does not list RSS feed links on its pages. Now You: Do you use RSS feed readers? Yes, it’s my favorite but I suggest also the similar “Want My RSS”. For years I would rely on a stand-alone RSS feed reader application (Liferea) but several months ago switched to ‘Feedbro’, a Firefox extension developed by Nodetics. It has a very extensive options menu and has been working out well. It took a while for me to switch from a separate program to having my RSS tasks integrated into my web browser but Feedbro’s feature set was a significant upgrade. Tried out a handful of recommended add-ons when Live bookmarks got canned and settled on Feedbro, pretty content with it. I’m using livemarks and have been happy with it. Avid user of RSS but it is getting harder to find a good RSS reader as many are no longer alive (Bloglines, Google Reader) or others have simply stopped supporting what they have (Netvibes). I find RSS feeds give you a direct access to a topic, brand or website with the options to skim thru articles or read in depth. Much harder to peruse a major site with 25 plus topics on the opening page, most of which I am not interested in. RSS makes this a more efficient process IMO. With FF removing the RSS feeds preview option, this is a welcome and good find. I recently starting using it and it is far and away the only experience that comes very close to the exact subset of functionality I used and needed from the old Sage. It has also been actively developed lately, for a month or so now. As there is no public source code though, I am not sure how active development has been historically though. Wow. Thank you PD. Been trying this now for an hour or so and love it. Thanks for this. Necessary functionality for me. Full standalone feed reader (RSS, Atom, RDF) as a Firefox/Chrome/Vivaldi extension. Finds feeds from web pages and makes it very easy to subscribe to new feeds. The feed finder is quite elaborated, for instance discovers Youtube feeds whilst others don’t. The feed reader is excellent, well thought, well carried out. No fuss, complete, fast. Been using this addon since FF removed the feature. Sometimes the feed reader selection dropdown at the top is blank, I just hit F5 and it populates upon refresh.